How To Do MLA Format using Pages on Mac? All text is font “Times New Roman” & Size 12. One-inch page margin for all sides (top, bottom, right and left). A header with your last name and page number 1/2 inch from the top-right of each page. The entire research paper is double-spaced. Your name, name of professor, course title, and due date of paper on the first page. Your research paper title is centered. Body paragraphs have a 1/2 inch first line indent. A Works Cited page beginning on a separate page at the end of the paper. 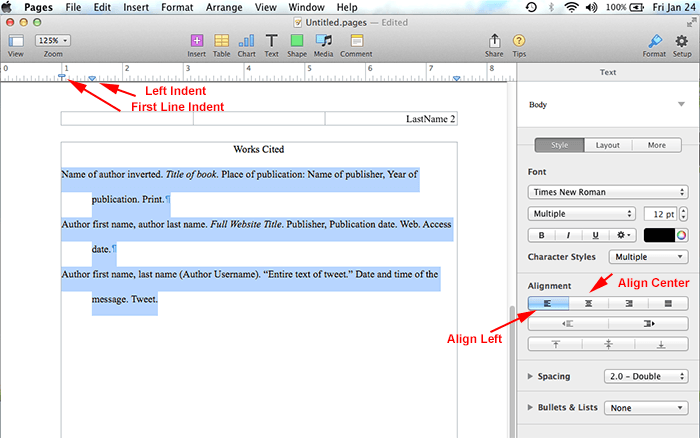 Start your Pages App => Click on New Document to create a new document => Choose the Blank Template. By default, Pages uses font Helvetica and font size 11. These are not right and we need to change them. Click on the font name and change it to Times New Roman. Click on font size 11 and change it to font size 12. By default, Pages uses the default margin of 1″ inch for all top, right, bottom & left and that is correct so there is no need to change. 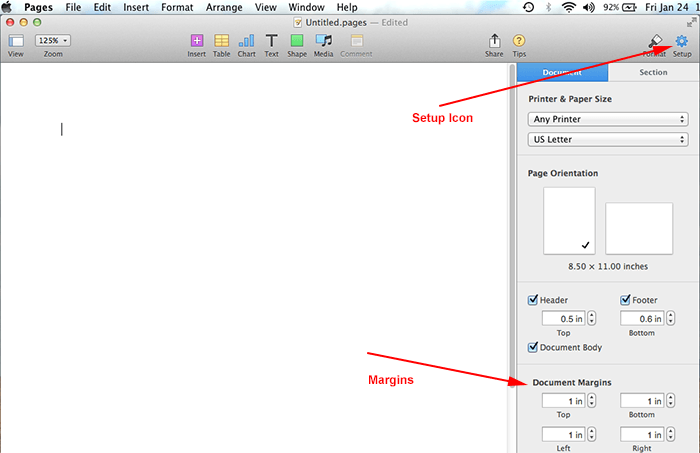 If you would like to verify the margins, here are the steps: Click on the Setup icon located on the very top right corner => then set the margins under Document Margins. Click on View => click on Show Layout => a layout of your document and header should now appear. Click on the Format Icon to display the font properties (see in the image below for the Format Icon location). Click on the 3rd box on the Header. Notice the font on the Header is NOT Times New Roman => change the font to Times New Roman. Type your LastName => hit the Spacebar key on your keyboard once => click on the Insert => click on Page Number (to insert automatic page number). 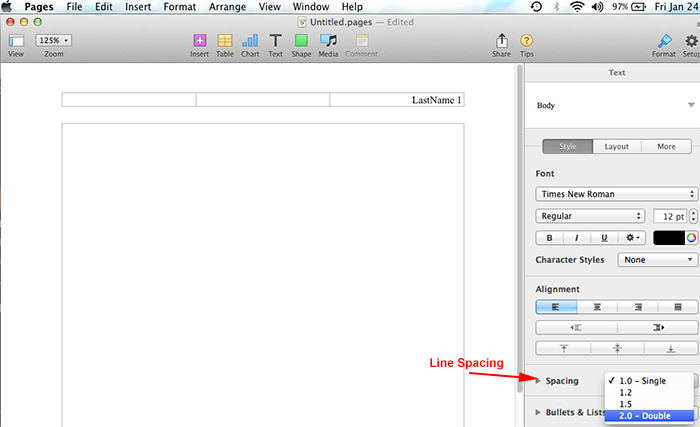 Under Spacing => click on “1.0 – Single” and choose “2.0 – Double“. Type your full name => press Enter. Type your professor’s name => press Enter. Type course title => press Enter. Type your paper’s due date => press Enter. 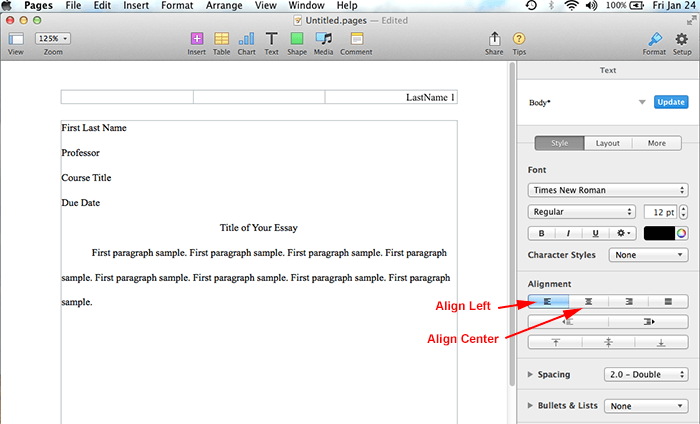 Click on the Align Center icon on the formatting toolbar (to center your blinking cursor) => Type the title of your paper, capitalizing the first letter and all major words and proper nouns. Do not use italics, boldfaced type, underlining, or all caps to format your title. Do not type a period at the end of the title => press Enter. Click on the Align Left icon (to bring your blinking cursor to the left). A heading “Works Cited” centered one inch below the top edge of a new page. Do not bold or underline this heading. No indent on the first line of each entry. If an entry runs more than one line, indent the subsequent line or lines 1/2 inch from the left margin. Alphabetize entries in your list of works cited by the author’s last name, using the letter-by-letter system. Immediately after typing the final line of your paper, click on Insert => Page Break (to begin a new page). Your header with your last name and automatic page numbering should appear at the top right of your paper. Click on the Align Center icon so that the text is centered. Type Works Cited (do not underline, boldface, italicize, or enclose the title in quotation marks). Press the Enter key once to begin a new line. Click on the Align Left icon so that the text is aligned left. Now type your sources. Don’t worry about indentation on the subsequent line/lines yet. Once you are done typing your sources => highlight all your sources => click on View => click on Show Ruler => now click on the Left Indent icon and drag it to the 1/2 inch mark. Now click on the First Line Indent icon and drag it to 0 inch mark. You are done setting the Hanging Indent for your Works Cited page. I hope you found this tutorial helpful. Take care! OMG THANK YOU LIFE SAVER!!!!!!! Excellent work explaining the MLA format! The picture and text combo made it clear and easy to understand. Buy yourself a cookie; you deserve it! Thank you, you helped me make indent hanging. Beautifully explained, thank you to whoever took the time for such an excellent guide. Thanks so much for the help! I would’ve failed If it wasn’t for you! Is it normal when I get to the bottom margin and after my last line of text before the page changes there is another blank line? This makes my margin look like a 1.25 margin. The only way i can get the last line of text to rest in the margin is by making the spacing between paragraphs 14pt, is that allowed in MLA? Thank you for the MLA format instructions, it was really helpful. Just wanted to let you know, this is the best thing ever. My microsoft word just expired and my paper was due today. Thanks to you I got it done perfectly. Thank you very much!!! So helpful. Thank you so much!! Just wanted to take a moment to thank you for posting this! So very simple and helpful! Super awesome!! Thanks heaps!! Definitely saved me from exporting to my Windows computer and making it in there. Thank you for spending the time on making this! Really helpful! Thank you so much. You are amazing. This was very helpful. What wonderful help. I’ll certainly keep this on hand for my university papers. Thank you for making my switch to MAC easy and affordable. This is a good resource. Previous post: How Do I cite a Tweet in MLA Format?